Aerial view of the triangle formed by 19th Street, Harrison Street, and Lakeside Drive, including Snow Park, the Bechtel Building (244 Lakeside), and the Regillus (200 Lakeside). 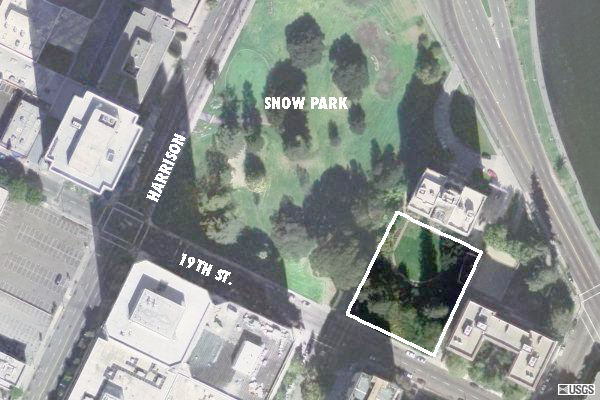 Schilling Garden (in the highlighed rectangle) is located behind the Bechtel Building and aside the Regillus. Here you’ll find larger and higher-resolution versions of photos and graphics appearing elsewhere in the Grand Lake Guardian.